The typical operation and management of an IMS - Information Management System - can be very challenging attending to the different natures of activities that need to be carried out. Our IMS Module was specifically designed to support your information security management strategy, compliance and operations. 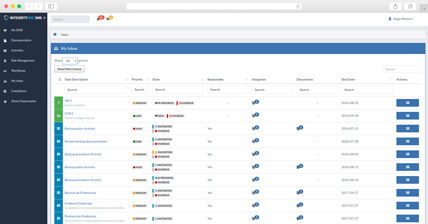 IntegrityGRC enables organisations to map and track their assets by providing a broader view of all resources and with the aim of reducing implementation impacts, avoid financial penalties, optimise cost-effectiveness, reduce risk, and increase value. Data is collected from many unstructured sources and entered in the platform to be kept organized and structured and it is also possible to import and export existing resource data in spreadsheets. 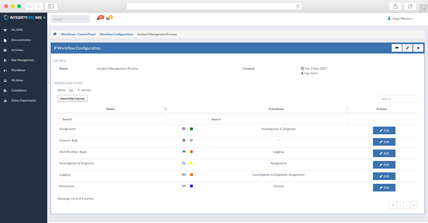 Use and create workflows to support different processes of security management. IntegrityGRC platform enables organisations to match risks to be treated with risk treatment processes and associate them with controls and assign responsibility to the users. The IMS allows organisations to ensure an efficient and prompt response, analysis, documentation, ongoing management and reporting of incidents combined with procedures that allow the alignment of management activities and priorities with the business strategy. Nowadays, workflows rules and the structured path of processes followed is a priority in any business to improve the efficiency of operations. 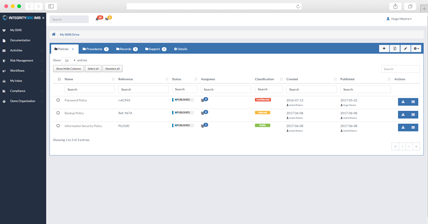 IntegrityGRC-IMS incorporates a workflow builder which enables organisations to carry out multi-step processes communicating efficiently. By allowing the proper association of required controls and assignees to each step of the process and its consequent relevant notifications makes up a very valuable feature set. It also serves to provide guidance for the existence of consistent business controls throughout the organisation and to define responsibilities for managing them. 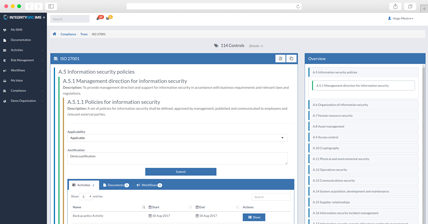 Use and create workflows to support different processes of Security Management, namely incidents, changes, implementations, access control, nonconformities, among others. IntegrityGRC – IMS also saves time and process costs of applying simultaneous updates to related assets and configuration controls and classifies them according to certain criteria. Combine processes and information using multiple referential*. IntegrityGRC-IMS was developed to deal with the combining of information from multiple referential structures and their requirements and supports organisations with the rapid integration of controls to better manage ongoing audit process. As benefit companies start spending more time on operational improvement instead of on the audit and certification process. The platform enables assignees to link the risks they identify to the policies they create to the processes they administer. By using the IMS, users have an overview of referential, controls applied, who created them, and current actions and versions in practice. Documentation Management Integrated with the remaining resources of the system. 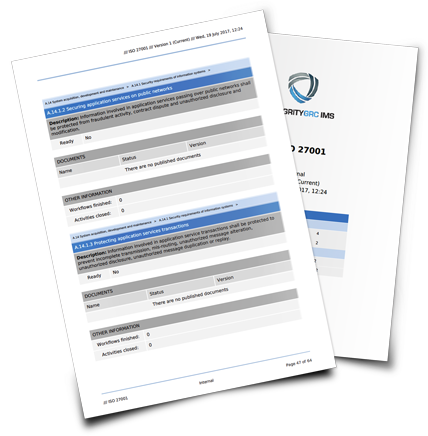 IntegrityGRC was specifically developed to support document management that covers the processes, procedures and records of organisations, making them available in a flexible and efficiently way. Use documented policies and procedures to clearly delineate the control activities performed throughout the unit's various business processes. 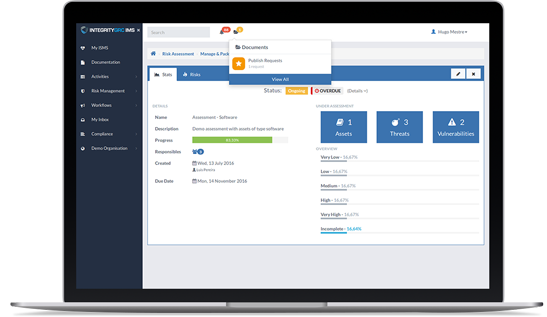 Our product allows multiple assignees to create, edit, and update documents simultaneously, all within a single environment. Now, document review is more secure – all users can make and view comments without having to exchange several emails. Document access is controlled with granular permissions that can be set on each document. Manage all the processes and activities around implementation and operation. IntegrityGRC – IMS is easy to adapt as your business changes and management can rapidly to manage end-to-end processes with related documents, data, processes, activities and workflows. Configure parameters and scope, and perform risk analysis actions while maintaining the ability to export and import Excel. 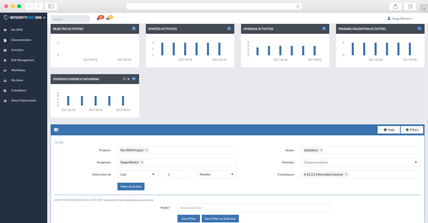 Monitor the processes using customized dashboard. IMS provides highly visual graphical dashboards, real-time alerts, access to reports, as well as other monitoring and analytical features to monitor your key performance indicators and gives you real-time access to critical information about your business. Integrity-IMS allows organisations to create customizable dashboards displaying only information for which you are responsible for. Nowadays, organisations are increasingly bound to comply with legislation and industrial requirements such as PCI DSS, HIPAA, ISO 27001, amongst others. IntegrityGRC makes it easy to collect and deliver your information to management faster and with greater data consistency. 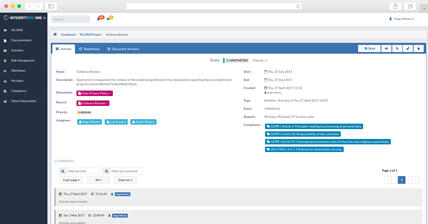 Create collaborative and sustainable processes for your team with our platform to obtain appropriate audit evidence regarding compliance through the production of approved and signed quality documents. The process path made tracks all changes and shows who made changes and when, providing a history that is accessible at any point in the process.